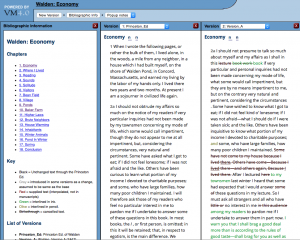 A Recap: What is Walden: A Fluid Text? It is not all books that are as dull as their readers . 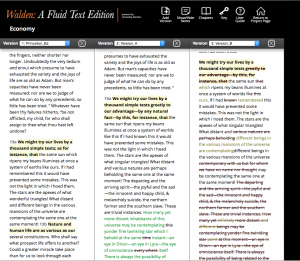 . .
With the release of the newly updated Walden: A Fluid Text comes plenty of detail, and quite a few major features. SUNY Geneseo’s Fluid Text team has worked primarily to clean up and edit the text, and to work on a new face for the project. Various bugs and textual errors reported by ours users have been amended, and we used this data to forecast how we wanted to improve the webpage for this update, and this is what we’ve done. Our Walden: A Fluid Text Data Dictionary has been updated, so now TEI experts and novices alike can view the substratum of encoding mark-up– the usage of TEI elements and attributes, as well as definitions and further usage tips. On a similar note for coders and the curious, our XSLT source code is now available [zip, tar.gz]. Support for Thoreau’s journal notes (added by Dr. Paul Schacht’s “Literature and Literary Study in a Digital Age” course students) are now available in our work as Notes studded throughout the text. These journal notes were the earliest conceptions of many famous thoughts and passages found in Walden, jotted down by Thoreau years in advance. If you want to take a look at the student work and how this was done through scholarship and various coding methods for this semester-long undertaking, head over here. 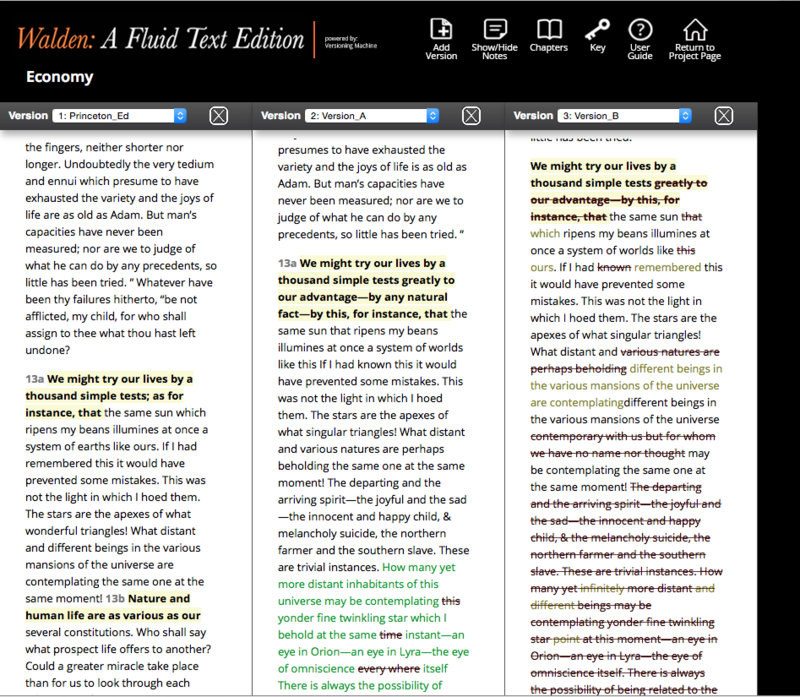 In our polishing, we’ve also overhauled the graphical qualities of Walden: A Fluid Text. Stylistic textual rendering has been tweaked, and the distinctive tables in Economy, the inaugural and often mathematical chapter, are reformatted for easier understanding. 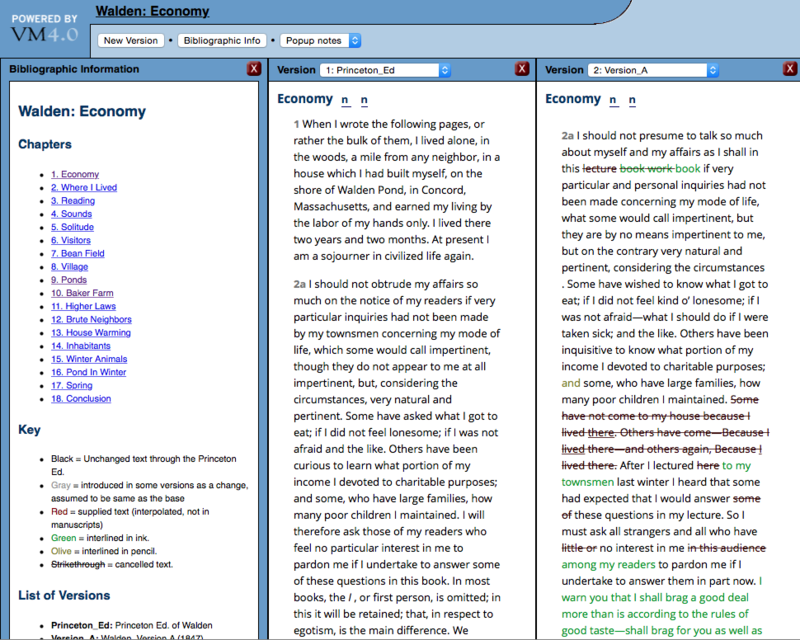 Currently, individual columns in the versioning machine layout can now scroll independently of each other as well, so that reader’s can compare different sections of Walden at once. Our Fluid Text, as the name suggests, is always changing, and we have many more features in mind. In keeping with the possibilities of digital tools, and TEI in particular, we have a planned revamp of the website interface to gild our look with a simplicity inspired by Walden itself. Dr. Paul Schacht plans on involving students in this project through further work in his Digital Studies course. A new users manual is planned to accompany the new look. Special attention will also be paid to accessibility on tablet screens, for scholars who want to read Thoreau in the library and woods alike. No wonder that Alexander carried the Illiad with him on his expeditions in a precious casket. A written word is the choicest of relics . . .